Estroven is one of the many menopausal supplements that provide nutritional support for women during their menopause years. Estroven helps women to manage the physical and emotional changes that occur during menopause. This manufacturer states that this is a safe and effective product, and has been in circulation since 2001. Estroven provides a range of product options, depending on your specific symptoms, consumers are able to select the most appropriate for their individual needs. This on the surface sounds like a positive benefit, however, upon further exploration, there are over 8 different product options. This can be overwhelming and unrealistic for women who are suffering multiple menopause symptoms. Taking 8 different supplements isn’t really cost effective of realistic. However, we felt that the company had a good reputation so, we dug a little deeper. Each provides support for coping with different elements of menopause suffering including hot flashes, night sweats, fatigue, irritability, manage weight and mood swings. Black cohosh – has been used to help control the symptoms of menopause such as headaches, hot flashes, mood changes, sleep problems, heart palpitations, night sweats and more. Soy isoflavones – isoflavones help deal with hot flashes. Melatonin – helps control circadian rhythms (sleep and wake cycles). Ginko Biloba – helps improve circulation, mood and mental performance. L-theanine – an amino acid, derived from green tea, can help improve anxiety, enhance cognitive development and regulate treat high blood pressure. B Vitamins – helps manage symptoms such as fatigue and memory issues. Dosage is dependent on the individual product. Clear details are provided on the labels of the supplement bottle. Estroven can be purchased both in local stores and online. One box costs $21.99 which is a pretty much on par with other similar concerns. A box is good for 2 months since it contains 60 caplets and generally, consumers should take one a day. However, we were unable to find any confident money back guarantee, which is always a shame. Should You Buy Estroven Menopause Supplement? 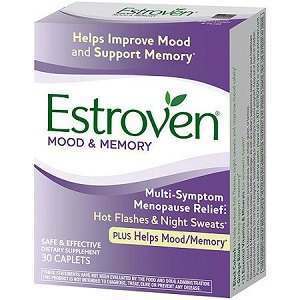 Estroven is made of all natural ingredients to help women deal with symptoms of menopause. It would appear that this manufacturer understands the many difficult to manage symptoms that menopause can bring. However, their range of different treatment options is at best, very confusing, leaving many potential customers wondering which one is the best option for their individual needs. With no guarantee and limited reviews, we were unable to ascertain whether users had found their products beneficial. We felt that if they simplified their foormula and limited their product options range, consumers would find it easier to make a purchase. Jackie Horowitz	reviewed Estroven	on December 10th	 and gave it a rating of 2.5.